The Department of Tourism lists several places to see (tourist sites) in Misamis Ocidental. Some information also available at Misamis Occidental's official website. The province's hidden gem seems to be Misamis Occidental Aquamarine Park (MOAP), recommended by a local to Tutubi but didn't have the time to visit even if it's said to be just a mere 15 minutes away from Ozamiz City pier. 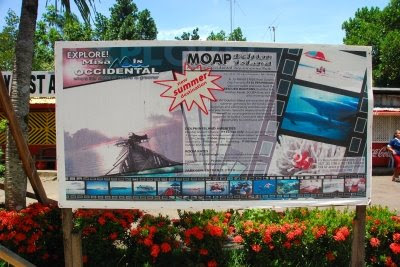 According to the billboard, MOAP, located in Sinacaban town, is "a 15 minute ride from Ozamiz City. For only P130 per person, you can watch and even feed the rescued dolphins, feed the fish, snorkel, kayak, SCUBA dive and do a lot more activities. at Ozamiz Airport, try not to eat the nearby restaurants (e.g. Noynoy's) inside the airport complex. Food is expensive as in more expensive than usual Manila prices, Tutubi called it highway robbery for such simple dishes ordered. Misamis can be an alternative tourism gateway to Mindanao if given the chance with proper promotion and development of other tourism infrastructure. 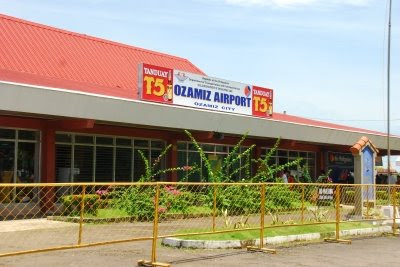 Ozamiz Airport Terminal fee is the usual P20.00 for small provincial airports. Flights to Misamis Occidental are via Ozamiz City from Manila serviced by Air Philippines and PAL Express (code-share with AirPhils) with daily flights but prone to delays. Cebu Pacific Flights wil be available in November 2008. Flights from Cebu to Ozamiz started just last September 14, with flights every Tuesday, Thursday and Sunday. Buses from Cagayan de Oro, Pagadian, Zamboanga City and Dipolog also service the city's commuters. There are are regular ferry scheduled trips from Mukas, Kolambugan town of Lanao del Norte across Panguil Bay for about 30 minutes travel time. Mizamis? oo nga no? andami ko pa talagang di nasisilip sa Pinas. this is my home town! thanks for featuring this in your site. Thanks for including Ozamiz city in your site. Nice pics of the airport. iloilo and bacolod are also classified as highly urbanised city. hello..pwd mangutana?,,pila ka minute gkan dra sa hotel sa moap to labo airport?..sau man gud ang flight nako 7am,din gkan pako sa lanao,so balak nako nga mag stay muna dra sa inyong hotel then forward to my flight..pakisagot lang po...pls send ur rply to my add (delaaiza@yahoo.com)..thanks..
how much does it cost for a ride from the airport to bus terminal? thanks....please send me a reply at my email joaben_md@yahoo.co.ph. Many thanks!!! wow,8 was a nyc place!!! i hope diz days,mkarating din aq sa place nyo..really exciting!! naomi's botanical garden and regina's natural spring swimming pool are must visit places also. i want to visit this place for this month's travel:) loved to travel and travel and travel!!! My name is John, citizen of Denmark. I am not young but old. Experienced traveller in Asia for many years, especially in Thailand and the Philippines. I have been in Ozamis and Clarin more times. For the time being [Feb. 5, 2012] I am in Ozamis. I'll be here 6 weeks. This week is the 5th of 6. I used to stay in Clarin [Cocos Island Resort in Clarin] but changed this time to an apartment furnished with second hand furniture probably dumped by the owner. I sleep on the worst mattress with squeaky springs. In the yard there are 6-8 barking dogs fighting for fun during the night. Only the rain make the dogs stop to bark. The landlord is Mrs. Michelle Caballero, Purok 3, Malaubang, Ozamis. A short ride with motor cab from the city to one outskirt of Ozamis called barangay Malaubang. It could have been a nice place with a pleasant view across the bay to the coastline of the opposite land. A greedy landlord like Mrs. Michelle Caballero can destroy all pleasure. We had an agreement she would pick me up in the airport. No show up 30 minutes or more after landing. Many mock excuses for being late. Actually she had another appointment at the same time with me. I pay 600 pesos per day including electricity, water, cleaning, bed linen, towels. There is no room cleaning, I do it myself from the first day. Towels? No towels. But the main problem is the missing water supply. Water is present but it must be pumped to the water container on 4th floor. She will only allow the pump to run a few seconds to avoid overheating of the pump is hers argument. I must shout angrily to her 8 to 10 times a day and fight with her to have my daily water ration. If there are more lodgers in the house the water tank is empty most of the day. Imagine yourself in a shower with no water while you can see the water floating over in hers water container. The old TV-set in my room is not functioning. It is too expensive for her to be repaired. If you are tempted to look for temporary accommodation in Mrs. Michelle Caballero's house in Malaubang I recommend you to find another place. There are many other possibilities in Ozamis.